Apple has finally lifted the construction equipment around its Fifth Avenue Apple Store in New York City. The store, which was designed by Steve Jobs, has been undergoing an extensive $6.7 million renovation since July. The reason? Jobs wasn’t happy with how many panes of glass it took to make the iconic 32 foot by 32 foot glass cube structure in Apple’s store. Despite the construction, the store has remained open 24/7 until today, when the store was temporarily closed and then re-opened at 10am. The old cube was made up of 18 panes of glass per side, held together by metal joints. The new cube is less blue and has only three giant panes of glass per side. It also no longer has the small metal cylinders surrounding it. We can’t decide which look we like better, but it’s clear that the perfectionist redesign is something uniquely Apple. Other Apple Stores have been undergoing renovations in New York as well, but we haven’t been able to see if they are finished or not. For a long while, many Apple Stores were littered with notes, books, flowers, and other personal items honoring the late Steve Jobs, who died in October. Since its opening, which was funded by Steve Jobs himself, the Fifth Avenue Apple Store has become a landmark building in New York, often photographed and ogled for its unique look. 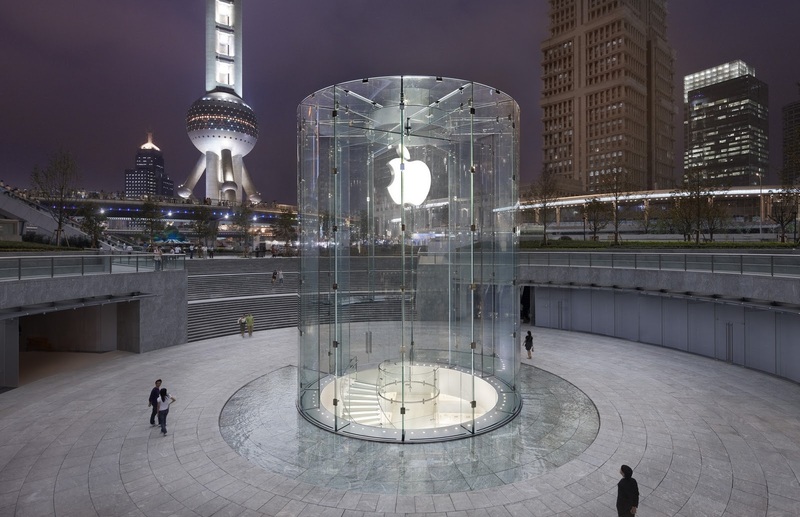 The store has brought so much attention that other Apple stores have taken on its glass stylings, like the new Shanghai Apple Store, which is similar but is shaped like a cylinder. We expect it may get a similar unriveted redesign at some point.